Here you will find a gallery of Bengal cat photos. So if you love these wild-looking felines you’re in for a treat. These felines have wild ancestry in their blood. Bengal cats originated as a result of crossing a domestic cat with an Asian Leopard Cat. Despite their wild origins though, Bengals of the fourth generation (F4) are quite domesticated. 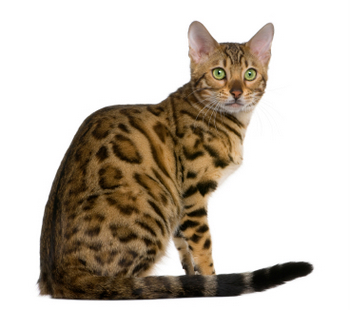 By the way, if you want to learn more about this fascinating breed check out this article, which has more information about Bengal cats. Love Bengals and/or wild cats but can’t have your own? Then get a picture showcasing Bengal kitties. By the way, a Bengal cat photo also makes a fantastic cat lover gift. The pictures shown below are brought to you in affiliation with AllPosters.com. Sometimes, I think of Bengal cats as smaller versions of the Bengal tiger. However, the Bengal cat looks more like a leopard than a tiger. I guess it must be the name. I hope you enjoy these pictures as much as I do. Here are more Bengal cats pics. For more information about Bengal cats and to see additional pictures of cats, please visit the pages listed below.